1. I'm revealing my Bad Girls April projects... I loved this kit. It's is full of vintage looking design and fun extras like butterfly Hambly and puffy Thickers! Here's a peek at what the main kit has: You can get it at Bad Girls Kits for this month, but hurry they go fast!!! This is a very vintage picture of my great-grandma and her sister in Hico, Texas. They look so fresh and young here in their dresses and hats. I loved it the minute I saw it in a pile of old pics as my mom was going through old albums. I wanted it! I didn' t know who they were at the time but the photo conjured up all kinds of stories in my mind. 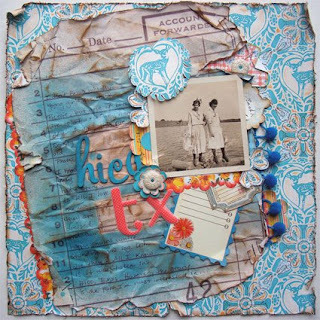 I loved distressing the Jenni Bowlin paper with glimmer mist (I used Riptide here) and shipping tags as masks. I then crunched it and inked it. YUM! This is me! I was 10 months old here and look at all that hair. I always had a ton of dark hair. Don't you just love the fabric on the highchair? So 70's. 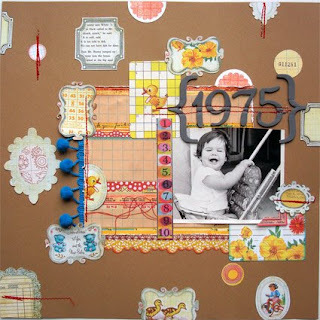 I loved the Sassafras paper and knew I wanted to cut it up and use it in pieces on kraft paper. I then imitated the red stitching using my sewing machine so that it matched. So fun! This is a photo of my sister and I in 1979. It's yellowed due to age and being stored in a sticky album. I love the butterfly overlay so much that I had to cut it up and use it on multiple layouts. It had so much color that I layered it over yellows and teal paper. 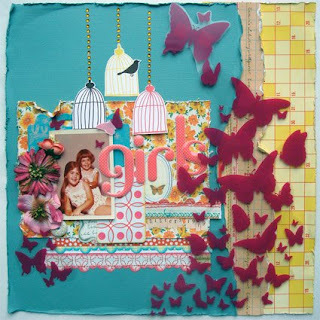 I loved cutting out the birdcages and layering all the girly colors. This was using the C & T Publishing purse shaped album. I looked at this album so much and tried to invision it as something other than an album. I took the middle pages out and left the covers intact. Added sides, styrofoam, and papers to create a basket. Then I made the flowers out of cut paper circles (maybe I'll do a demo on that later... I got it from somewhere on the net), and added ribbon. Viola! A Spring statement... April Showers bring May flowers! This is my favorite one... I was inspired by an old ad that Wendy supplied us. It had a picture of a record on it. I had this old 45 and wanted to alter it and add it to the page. I say the same things all day long to my son and knew that I wanted this page to have alot of drama and energy. The colors are bright, the paper is curled and punched using Irene Tan's technique to distress it. I went so far as to punch the record with my Crop-a-dile! Okay, now run and get that kit and then COME BACK here for a demo/ tutorial on metal leafing! I'll be back to post that and the RAK I'm giving away this week in a bit. 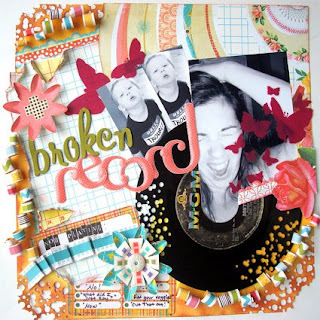 Fabulous layouts - I LOVE your hole-punched record! Ohhhh I am loving all of your projects, too!! fantastic inspiration!!! tfs!! Cool projects, looks like a fun kit! Jen, I'll say it again, you rocked the house with these layouts. LOVE THEM! These are totally amazing, Jen! 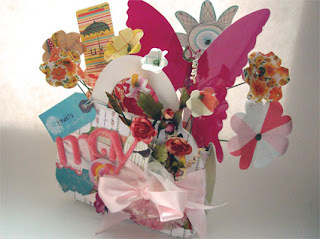 I love the butterfly bouquet! Love your Kit work! FUN AND Funky, so cool! Sweet LOs!!! Really, they are so rad!! I love these LOs! Great colours, so much fun!